Liverpool Sound City reveal second wave of acts and venues for 2018 festival, Getintothis’ Jack Carter on the full hit coming to the Baltic Triangle in May. 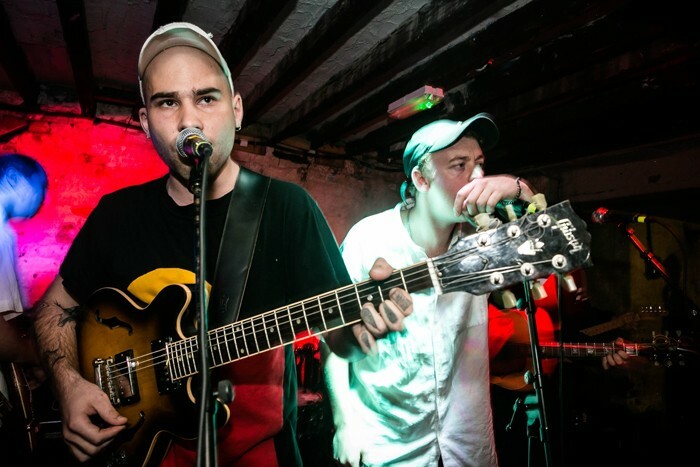 Liverpool Sound City have revealed DMA’s are to join Peace as headliners for this year’s festival on May 5-6. They join The Slow Readers Club, Picture This, Idles, Wye Oak, Black Honey, Sunset Sons, Yellow Days, Baxter Dury, Jaws and Dermot Kennedy on the billing for this year’s Baltic Triangle festival. As previously revealed, Sound City is to return to its city roots and ‘new music’ ethos and in doing so has today revealed a number of the venues which will host the 2018 happening including Constellations, Baltic Market, New Bird Warehouse and Hangar 34. Gigs and other happenings will be hosted also in Great Baltic Warehouse, Camp and Furnace, District, Unit 51, Baltic Social, Red Door Vintage, The Tank Room, 24 Kitchen Street, Northern Lights, Hinterland, Craft Minded, Black Lodge Brewery and Tap And Still. Other notable additions include Superorganism, The Orielles and Neon Waltz who line up alongside big-hitters from Merseyside including GIT Award One To Watch 2017 winner Zuzu and Nick Ellis, The Night Cafe, Queen Zee and Paris Youth Foundation. More than 250 bands are expected to feature this year with the likes of Jade Bird, The Blinders, Gaffa Tape Sandy, Sorry, Sam Fender, Billie Marten, Matt Maltese and Saint Phnx all added today. Celebrated rapper and Manga author Shaodow, joins grime artist Vital and Scousers Beyond Average and Juke. Becky Ayres, Sound City’s COO, said: “We really feel the spirit of discovery and exploration returning for our 11th year, with a huge range of artists performing in some brilliant locations. The remaining acts revealed today are joined by Aadae, Airways, Alaskaalaska, Amaroun, Art School Girlfriend, Asylums, Benny Mails, Billy Carter, Billy Lockett, Bloxx, Brooke Bentham, Cabezudos, Carmody, Cassia, Dama Scout, Daniel Alexander, Danny Boy And The Carriages, Dave C. Rupert, Dead Buttons, Dishpit, Fine Creatures, Geowulf, Ginger Snaps, Gonne Choi, Haarm, Hanover, Hey Charlie, Hockey Dad, Holiday Oscar, Honey Lung, Husky Loops, Indoor Pets, Katie Mac, Kawala, Laura Oakes, Lennie Dies, Love Ssega, Low Island, Lucia, Malena Zavela, Marsicans, Modern Strangers, Monks, National Pigeon Unity, Neon Waltz, Nick Ellis, Night Flight, No Hot Ashes, Olympia, Otzeki, Park Hotel, Plaza, Puma Blue, Queen Zee, Redfaces, Sam Frankl, Sean Mcgowan, Spinn, Swimming Tapes, The Bohos, The Howl And The Hum, The Ninth Wave, The Rpm’s, Vistas, Vital, Vundabar and Yungblud. 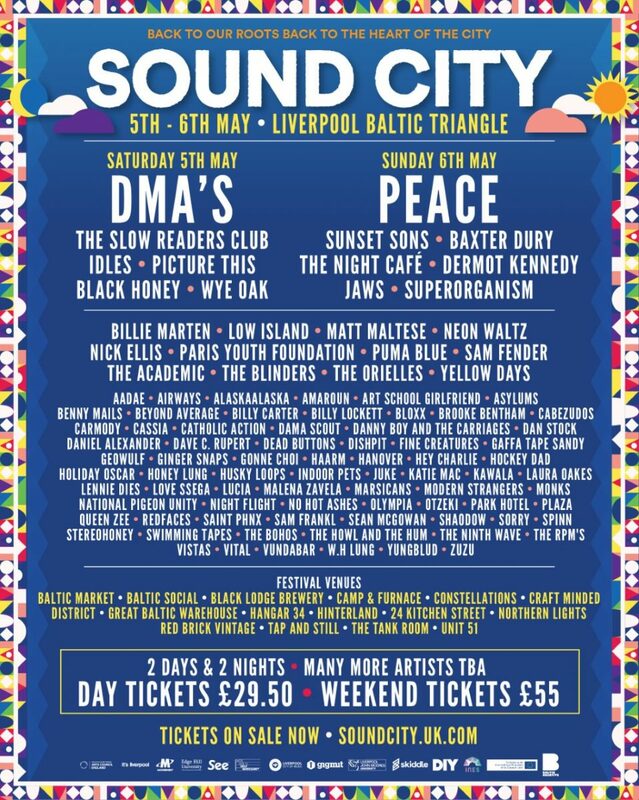 Sound City take place Friday May 4 until Sunday May 6, 2018.